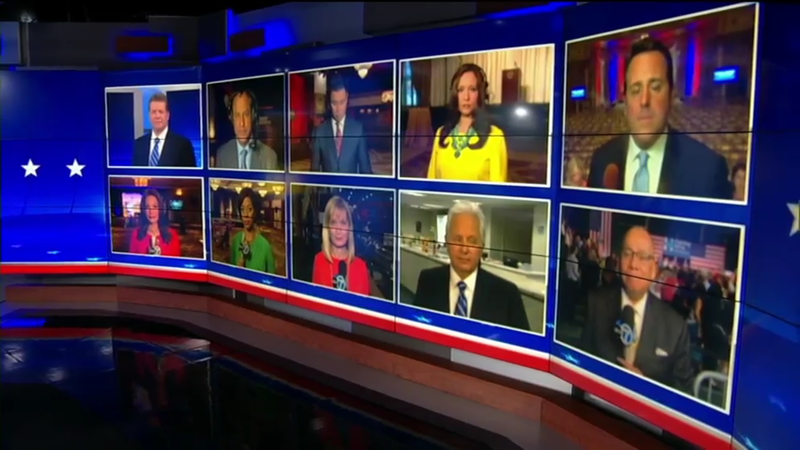 As part “Super Tuesday III,” stations in Florida, Illinois, Ohio and North Carolina all made use of their on-set video walls and panels to deliver eye-catching coverage. Perhaps most notably was WFTV-TV in Orlando, which used its two-story 13-panel wall of “windows” to display soft and subtle imagery of the White House as well as American flag motifs. The video tiles in the anchor desk were also used to display topical branding. 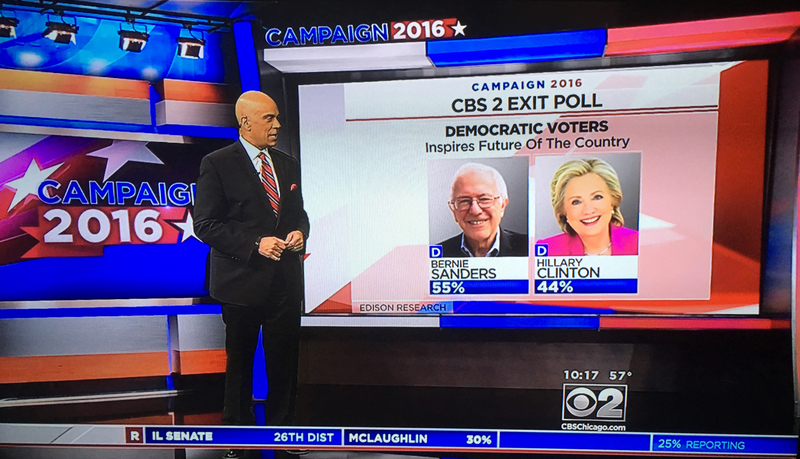 The station normally uses its video panel array to show off stunning cityscapes of its home city but changed things up for election night and gave a great example of the advantages video walls have in creating unique branding and topical image opportunities. In addition to the main set, the station also made use a smaller standup area for further breaking down the data while election returns ran in a blue bar across the top of the screen. Meanwhile, across town at WESH-TV, the scale was a bit smaller. 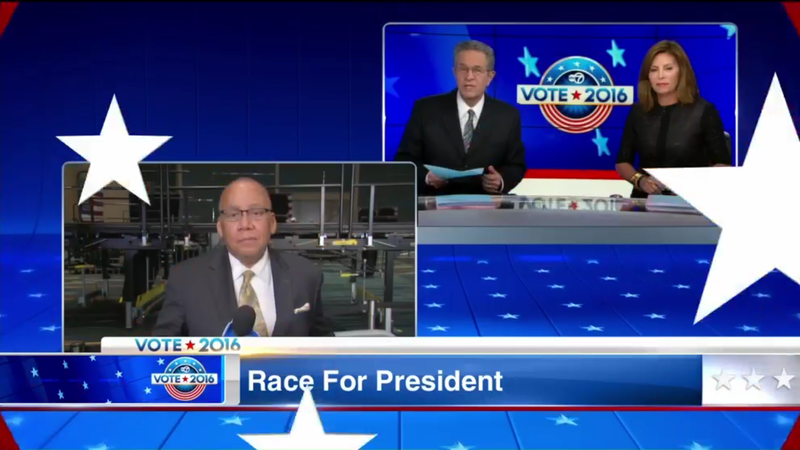 The station’s secondary standup set was used as home base, with Hearst’s “Commitment 2016” graphic shown on the freestanding video wall behind the anchors. Jumping up to a larger market, Chicago’s stations also made use of on-set monitors for their coverage. 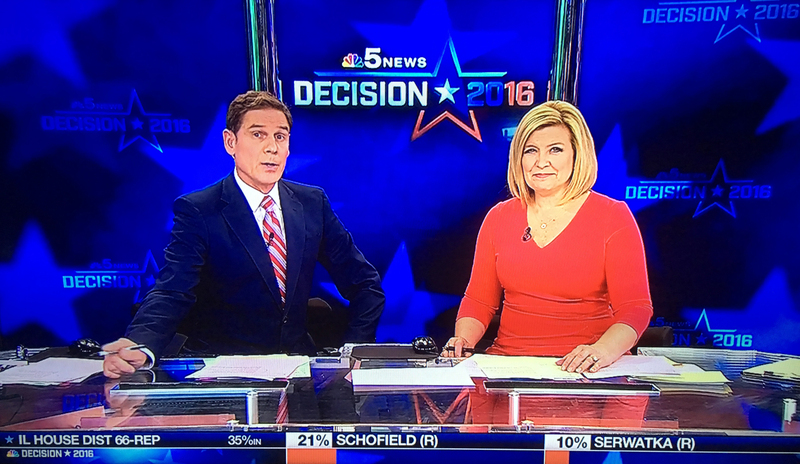 NBC O&O WMAQ-TV used its “windows” to display a branded animated background matching its parent network’s “Decision 2016” look while a narrow ticker showed election results in blocky segments. 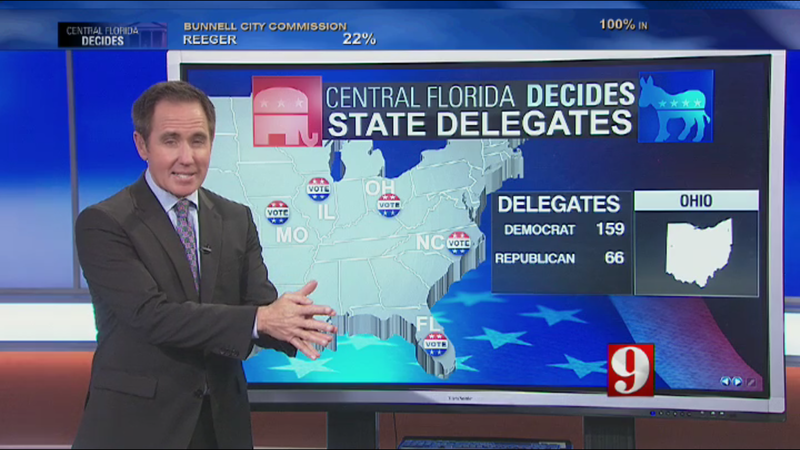 Competitor WLS-TV, on the other hand, also used its new set’s video wall for branded backgrounds but also frequently cut to off-axis wide shots of the wall displaying both election data graphics and live shot arrays like this 10-box. 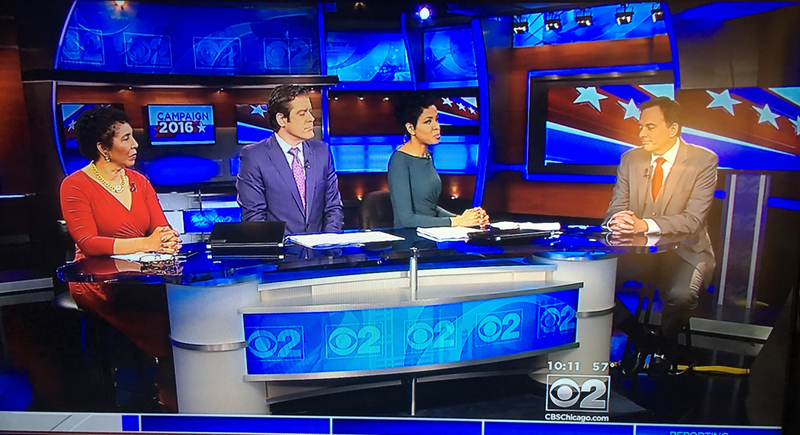 The market’s CBS affiliate, WBBM-TV, used its normal set but traded out the colorized skyline graphics on the smaller video panels for branded graphics. Perhaps most notably, however, was the station’s use of a virtual standup location in “Studio B,” where focus was put on crunching data. 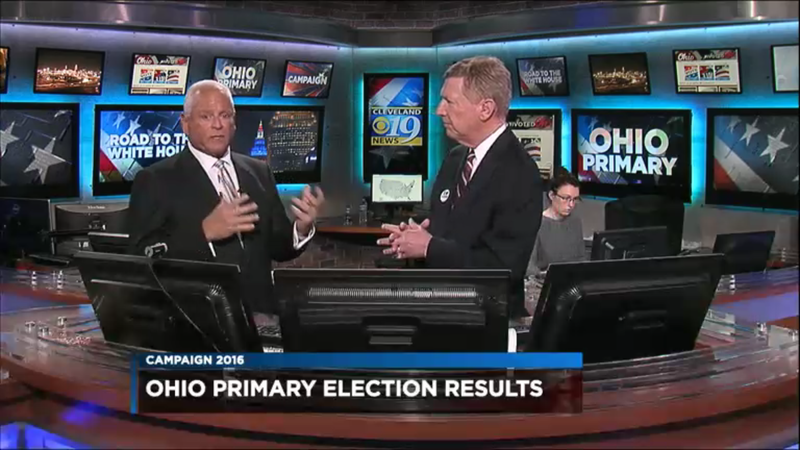 The design of the virtual backdrop closely matches the look of the station’s streetside set, with some updates such as the added “Campaign 2016” letters perched atop the header and multicolored backlit elements. 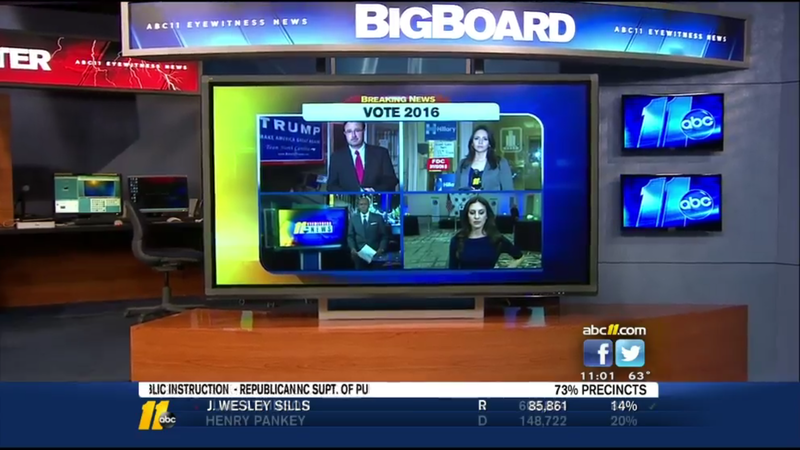 Back along the east coast, WTVD-TV in Raleigh used its “Big Board” touchscreen in its coverage in place of a large video wall background. 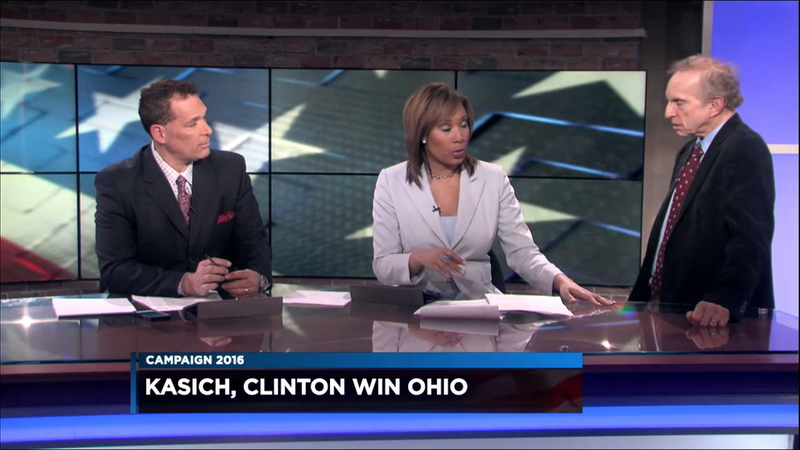 Cleveland CBS affiliate WOIO-TV fed an animated looping American flag background to its on-set video wall behind the main anchor desk, while also converting its tech-heavy weather center into a standing election area, complete with a staffer seated at a workstation.